New Jersey Governor Phil Murphy doubled down on his commitment to legalize recreational marijuana during a budget address earlier this month. New Jersey Governor Phil Murphy last week reiterated his intention to legalize and regulate adult use marijuana by the end of the year. At his budget address at the Statehouse in Trenton, Murphy again advocated for full legalization and urged state lawmakers to pass legislation. “I am committed to working with you to get this passed this year,” Murphy said during the address. 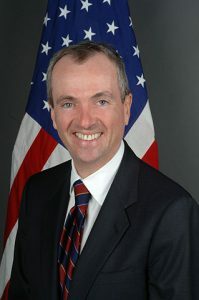 Sworn in as New Jersey’s 56th governor in January, Murphy vowed to legalize recreational marijuana in The Garden State throughout his campaign and since taking office. A bill to legalize adult use marijuana and create a licensed retail cannabis market in New Jersey has already been proposed by Senator Nicholas Scutari. The bill still need to pass both chambers of the state Legislature before it can be presented to Murphy to sign into law. At the same time, however, a bipartisan group of state lawmakers have proposed a compromise bill that would decriminalize marijuana, reducing the penalty for possession of less than 10 grams to a $100 fine. While doubling down on the commitment to legalize marijuana, Murphy refuted claims by opponents that decriminalization would be adequate for addressing the adverse impact of marijuana prohibition. A recent report from the ACLU found that New Jersey disproportionately arrests black residents. “Decriminalization alone will not put the corner dealers out of business, it will not help us protect our kids, and it will not end the racial disparities we see. If these are our goals – as they must be – then the only sensible option is the careful legalization, regulation, and taxation of marijuana sales to adults,” Murphy said. Murphy’s budget proposal includes $60 million in cannabis sales tax revenue. For that to happen, his administration would have to legalize recreational marijuana by the end of the year. In January, Murphy signed an executive order directing regulators to review New Jersey’s medical marijuana program and provide recommendations on how to increase participation by patients and doctors. He believes that administrative barriers and stringent rules put in place by former governor Chris Christie have hindered access. “Our goal is to modernize the program in New Jersey, bring it up to current standards, and put patients first,” Murphy said during his address. While marijuana remains prohibited under federal law, nine states and the District of Columbia have legalized recreational marijuana. Colorado, Oregon, Washington, Alaska, Nevada, and California have legalized adult use marijuana and have operating markets. Massachusetts and Maine have legalized recreational marijuana, but have yet to begin regulated sales. Vermont has legalized adult use marijuana, however the state has no intentions yet to establish a system to tax and regulate the production and sale of cannabis. If New Jersey legalizes adult use cannabis through legislation, it will be only the second state to do so. A recent poll found that 59 percent of voters in New Jersey are in favor of recreational marijuana legalization. Visit our news page for complete coverage of cannabis industry news, marijuana law changes, and the latest cannabis-related research.